Roxolani tribesmen are more heavily armed and armoured than most other Sarmatians and carry both bows and long lances, making them a valuable and flexible force in battle. Lancers represent a shift of emphasis in Sarmatian warfare from mounted archery and attrition towards furious charges and shock combat. Equipped with the kontos, a long lance over 4 m long that they wield two-handed, and wearing good scale armour, Roxolani Riders can deliver a charge that few foes, mounted or foot, can withstand. A solid wall of pike or spear points will still be largely immune to such frontal attacks. However, many horse archers still fight alongside the lancers and the lancers themselves carry bows and are adept at the feigned flight and all the other steppe manoeuvres that can throw an enemy into disorder. In addition to kontos, bow and scale armour, a longsword completes the lancer’s panoply. 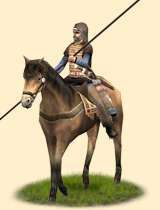 Historically, even the first armies of horse archers that emerged from the steppe probably contained a core of heavy cavalry. In this regard, the appearance and spread of armoured riders wielding a long, two-handed lance represented an innovation in steppe warfare more because the specialization of their equipment and their greater numbers than by being a radically new concept. For the Sarmatians in particular, these lancers were a relatively late development. Their first traces come from the Volga area in the 3rd and 2nd centuries BCE, but the troop type does not seem to have spread westwards for at least another two centuries. Moreover, the lancers proved to be a very effective complement of the horse archers, but they never completely superseded them. Nonetheless, Sarmatian armoured lancers made an indelible impression upon Greek and Roman witnesses and eventually became the archetypical Sarmatian image.